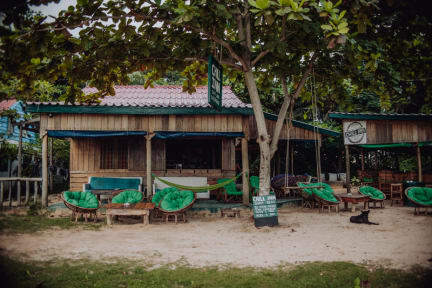 Chill Inn's natural designs blend in to the tropical jungle environment, making a stay with us a unique cambodian island experience. An eco-conscious solar powered inn offers a lounge, veranda, beer garden with a stylish well stocked bar catering to most desires. We pride ourselves in our selection of ice cold drinks to keep you refreshed all day & night. Our property has many place to chill in, we have recliners, hammocks & sofas, so just come, kick back and relax. 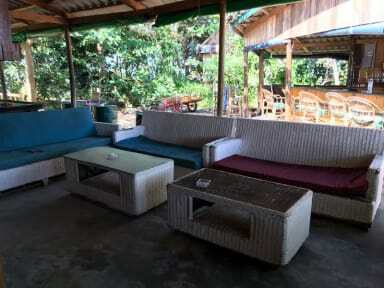 Chill Inn is a social hang-out & great place to meet other people. For your enjoyment we have games, books, beach sports equipment, pool table & 43' TV showing live sport & movies. Our hammocks are awaiting you, come forget your troubles. We do all we can to create an environment & vibe, so that you can just Chill. Inn. 1. Cancellation policy: 0 days before arrival. 2. Check in from 12:00 to 20:00. 4. Payment upon arrival by cash only. Credit card isn’t accepted. 6. Age Restriction - Guests should be over 18 years old. Best hostel so far! Amazing staff, great vibe and beautiful location. Definitely reccomend! Best place to stay on the island! Note that you are on an island and there’s no fast WiFi or ATMs. Clean, comfy beds with nets and loads of chilled seating outside. Good music playing all the time and a free beer a day make it easy to meet people. Could’ve easily stayed longer. Great hostel and perfect location. Staff were so friendly and met amazing people here. Ended up being very ill to no fault of the hostel and the staff were very kind and looked after me. Absolutely lovely place to stay! Amazing staff, good breakfast, and wonderful location. Definitely very chill. Lots of comfy chairs to relax in with a beach view. Plus 1 free beer for every day you stay! I definitely look forward to coming back. One of the best hostels I've ever stayed at. No ATM on the island, make sure you bring cash! great atmospere, friendly helpful staff, beach front with stunning views, would highly recommend checking this place out. Very cool staff, one free beer every day, they make you feel at home. Very good vibe and good music at the bar. Amazing hostel with a great atmosphere! Staff are wicked! It’s loud and if you want to get a good nights sleep then I don’t recommend but if you want to have fun and meet people this is the place to be! This hostel is a good place for solo travellers. The staff are friendly and the bar area is welcoming. A free beer each day is a nice touch to get everyone chatting together. Due to the open layout it can get noisy early in the morning from the bar. It’s in a great location. I’d recommend staying here. The reviews we read on here did not really reflect what we saw when we stayed at chill inn. It might have been an off week but we ended up leaving early because the room we were in had no door, no air flow as the windows wouldn’t stay open, cobwebs everywhere, holes in the mosquito nets and no loo roll (if you’re due on girls, don’t go).